Photo of Army Capt. William Lichvar by Compass Photographers. The U.S. now has more than 21.8 million veterans, roughly 537,000 of whom are unemployed. Helping identify opportunities for veterans – and giving them the skills to gain civilian employment – is a critical focus, according to Rachel Van Cleave, Dean of the Golden Gate University School of Law. The Third Annual Veterans Law Conference, hosted by Golden Gate in San Francisco, brought together veterans who attended as speakers and guests, sharing advice and their own experience getting jobs. The gathering has grown each year, building on Golden Gate’s commitment to helping veterans, which was undertaken by Van Cleave following the death of her law school classmate, J. Christopher Stevens, in the attack on the U.S. Embassy in Benghazi in 2012. Harris founded WVBC by following her passion to help vets in Houston. While it has no military base, the area has 300,000 veterans, 30,000 of whom are women. While attending an entrepreneurship bootcamp in Florida, Harris had to write a business plan, and she decided to focus on the growing number of women veterans. The center today has more than 200 members who attend networking events and business bootcamps. The center offers access to the hundreds of resources and opportunities available to veterans, including disabled veterans. Among the resources are the Veteran Entrepreneurship Act, which established a 3 percent goal for veterans in federal procurement, which is now in place throughout the federal government and even in some cities and corporations; and the Veterans Benefit Act of 2003, which allowed sole-source contracts, which is another powerful tool for veterans with proven skills. Currently, more than 9 percent of U.S. businesses – nearly 4 million – are owned by veterans, with revenues exceeding $1.2 trillion. There are now more than 400,000 businesses owned by women veterans – a huge increase over the past decade. And the largest number of veteran-owned businesses are in California – making Golden Gate an ideal host for helping veterans. She also encouraged veterans to study the Veteran Jobs Mission, which has helped 292,645 vets get jobs; the Fifth Third Bank Veterans program, which provides job coaching; the Disney Veterans Institute; Patriot Boot Camp presented by Techstars; and Entrepreneurshp Bootcamp for Veterans with Disablities, or EBV. And while there are tremendous resources and opportunities for veterans, there are very real struggles for veterans to find a job or the path forward once they leave the military. Whether a vet is depressed and can use a pet from Pet Aid for Warriors, or needs to know the ropes to navigate the testing to win a state job, there are people and groups that want to help. Captain Jeffrey Chaix of the Sacramento, Calif.-based Work for Warriors has helped place 4,500 veterans and service members into good jobs by partnering with 250 businesses throughout the state of California – including Amazon, Google and Starbucks. A key to improving job prospects is translating military speak – experience with an M1165 or a particular type of fighter jet, for example – into what that means for civilian employment. “If you’re a company commander, we transition that title to what it would be on the civilian side, if you list the trucks you drive in the military, we help you convey what that means to a civilian employer,” says Chaix. It’s also important to educate employers of the values that veterans bring to an organization beyond doing the right thing. Some employers may fear a veteran will bring post-traumatic stress disorder to a workplace, but as Williams said, “we all have PTSD in some way.” Again, the answer is education and addressing the issue. Some companies are also working to be able to extend preference in hiring to veterans, including Verizon, though there are legal hurdles. One route to ‘preference’ – which allows an employer to take into account military service – is to be able to extend a preference for disability. One of Golden Gate Law School’s missions is to help veterans who want to become lawyers. And veterans bring many skills that suit the legal profession. Kevin Dunleavy, the chief assistant district attorney of Alameda County, pointed out that as prosecutors, they are a public service, “and the ultimate public service are those that have served in the military. From a prosecutor perspective if we have someone who served in military that’s an automatic for someone we want to explore more.” The DA needs people who follow the rules and who can work with police officers, who are their primary witnesses. Many veterans have gone to law school, worked at the Alameda County DA and proven themselves excellent prosecutors, he said. Capt. 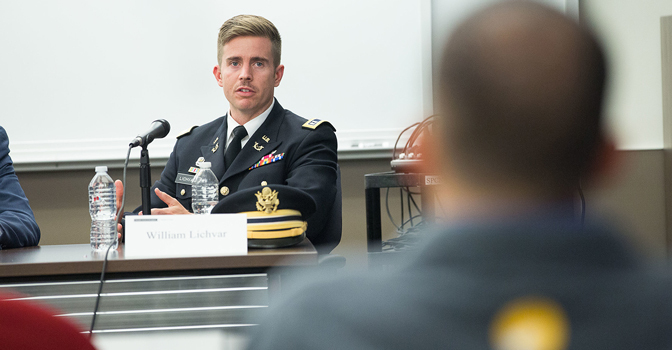 William Lichvar, a U.S. Army JAG, was deployed to Afghanistan as an operational law attorney, and is now a trial defense attorney at Ft. Carson, Col. He sees the characteristics of responsibility and leadership as shared traits of veterans and lawyers. “One thing that’s amazed me is the level of responsibility, whether 18-year old men and women operating million-dollar machinery to being an attorney. Photo of Lida Citroën by Compass Photographers. Dunleavy also stressed the importance of having a good moral compass and being able to make good decisions. In his years of interviewing law students, he finds military experience very attractive compared to a student who’s gone straight from college to law school. Schippers also suggested GGU’s legal education for veterans as a model for other law schools. Whatever path a veteran chooses, branding expert Lida Citroën advised spending some time thinking on how to transition your ‘brand’ as a military member to the private world. After 20 years in marketing and branding for corporations, she decided to use her skills to help military members after a halftime tribute show at a Denver Broncos game focused on the military. “A soldier said ‘I don’t know how to sell myself, or talk to civilian employers,’” she recalls. And a lightbulb went off. Though she had never served in the military, she spent six months knocking on doors, going to the VA, and the first person to open the door was General Peter Pace, a former U.S. Marine Corps General who served as the 16th Chairman of the Joint Chiefs of Staff. He founded the Wall Street Warfighters Foundation to help veterans and disabled vets get jobs on Wall Street. “You have a challenge talking about yourself,” she said. “As a civilian, I’m really comfortable telling you what makes me great. But for someone who’s served in uniform, I’ve learned that’s a conflict. If you talk about yourself and take credit for your success in uniform it feels like you’re taking credit for those who served alongside you. It’s an obstacle and barrier to gaining entry in civilian world. “If you use ‘we’ the hiring manager doesn’t understand,” she said. There are other challenges for military members enlisting on the civilian side. Giving orders, for example. While coaching a Colonel now working for a big corporation, Citroën found that he needed to adjust when no one stood up when he entered the room, or immediately followed his directives. Citroën advised him on the corporate side, it’s not always about the most direct path to get from point A to point B. Personal branding is how we create a relationship with our audience, she explained. “Who are you, not what are you. When you take that uniform off you lose a lot of that. The uniform is your story, who you are.” It conveys what you’ve fought for and committed to. Military members have the values and have proven it. The trick is to be credible conveying those valued in the corporate setting.